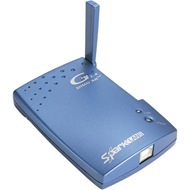 SparkLAN WUBR-300 MIMO 802.11g USB adapter offers you extreme wireless coverage and performance. You simply plug into USB port of computer and get connected, eliminating the needs to open your desktop. With MIMO technology, WUBR-300 USB adapter reduce the dead spots and is able to use for time-sensitive gaming and multimedia streaming chores in addition to less time-critical file transfer, web browsing, email, and messenger applications. Ideal for larger homes or offices that have a wider area to cover, users can experience the improvement in their wireless network range. SparkLAN WUBR-300 802.11g USB adapter is based on the Ralink RT2573/RT2671 chipset.